"Sir! Corporal Perez, "A" Company, CP's this way." — Perez, upon greeting John-117 during the Battle of Mombasa. Corporal Perez was a UNSC Marine assigned to A Company. He fought in the Battle of Earth, as well as in the Battle of Installation 05. During the start of the Covenant invasion of Earth, Perez and the rest of A Company were sent to reinforce the defenses of New Mombasa, Kenya, which was under attack by Covenant forces from the assault carrier Solemn Penance. The Master Chief met the Corporal in the proximity of a Marine field command post in an Mtangulizi Kampuni building where some Marines were held up, wounded, and making a last-ditch stand against the Covenant. He led the Master Chief to Staff Sergeant Banks' position on the roof. Perez was mentioned, but not seen, during the Battle of Installation 05, in which the UNSC forces and the Arbiter raced against each other to gain possession of the Activation Index, while the Flood tried to stop them. McKenzie and Perez were with Miranda Keyes and Sergeant Johnson, and evidently the only two Marines to reach the Index chamber alive. McKenzie and Perez were tasked with securing the exit from the chamber, but it is unknown what exactly happened to them during this endeavor. They may have been killed by the Flood, killed by the Arbiter, or captured/killed by the Brutes, as when Johnson calls them for their status, they do not respond. The Arbiter arrived shortly after, capturing Keyes, Johnson, and the Index. Perez was voiced by Tim Dadabo, who also voices 343 Guilty Spark. He is most likely named after the Bungie programmer, Adrian Perez. Based upon his use of the expletive "coño" during the Halo 2 E3 Demo, he is presumed to be of Spanish nationality or descent. 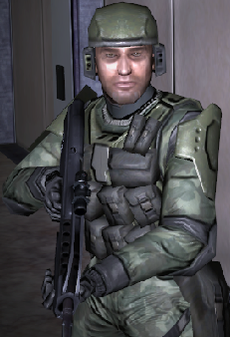 Perez is the only other marine to share the "Dear Sarge" line with Chips Dubbo during the mission Delta Halo.